Japanese filmmaker Kiyoshi Kurosawa's horror films are unlike any other J-horror films. This is partly a matter of cerebral approach, and partly a technical difference: he directs films differently because he conceives of his films with greater, and perhaps more eccentric detail than other J-horror filmmakers. Kurosawa approaches his films from a generic standpoint first, then a thematic one. He doesn't shoot many takes, and he does much of his job as a filmmaker before shooting starts. "Creepy," his latest horror film, is a true-crime story about ex-cop Takakura (Hidetoshi Nishijima) and his wife Yasuko (Yuko Takeuchi) and their dealings with suspicious neighbor Nishino (regular Kurosawa collaborator Teruyuki Kagawa). RogerEbert.com spoke to Kurosawa through a translator about location shooting, the wind, and the method in his madness. In an earlier interview with Midnight Eye's Tom Mes, you said that you're interested in characters with identities separate from a collective group, people whose flaws can be attributed to themselves, not some group identity. I thought about that in relation to "Creepy" since Takakura's identity is bound to two groups—the police department and his family—while his wife Yasuko slowly drifts away from identifying with her husband and their family. Do you see a fundamental contrast between these two characters? What drew you to them? I'm not interested in the influence of collective groups, such as workplace or local neighborhood, on the individual. Or I don’t want the kind of individual who is influenced by such collective groups to be a main character in my films. Takakura is deeply involved in the police department, and the University (where he works), but his actions are based on his own decisions and desires. The same is true of his wife Yasuko. However, there is one big difference: she develops an interest in her neighbor, though she would not have developed an interest in somebody like him in her previous environment. The suspense of this story starts from there. I've read that your screenplays function primarily as texts, and that you aren't visually descriptive of your films' settings because you prefer to discover what the film will look like during location scouting. Is that true of "Creepy"'s screenplay and locations? What were your priorities when it came to the film's artistic design/style/look? As usual, there were no visual descriptions of the places in the screenplay of "Creepy." And as usual, we deliberately looked for the locations around the borders of cities near Tokyo and its suburbs, where we finally came across the place that fit this story. This is the moment the story acquires images. This is one of the most important moments in filmmaking for me. It is difficult to explain in words what comes into play when choosing locations, but it is very important for me that the place can illustrate concrete and abstract concepts, reality and symbolic. You also told Tom Mes that films are somewhere between fictional narratives and documentaries of the reality that's going on in front of the camera. How did your conception of "Creepy" change as you set out to tell this particular story? To give you an easy example: wind. Wind often blows in this film. Sometime trees behind the character swings, or sometime the wife’s hair moves. Everything is an accident. Yet, to capture such as accident, we tried to start rolling the camera at a moment it looked like wind would start blowing. Sometimes the wind blew and sometime it didn’t. Either is fine. I don’t know how that gust of wind affects the story. I'm ok not knowing the effect. I think that's what the film is about. As a storyteller, you tend to think about films from a genre perspective first, then from a thematic perspective. How did the true-crime aspect of the story—the fact that it actually happened—affect the way you told this particular horror story? The film’s genre becomes a very important criterion to decide what to omit and what to depict. The first half of this film, as far as genre goes, is obviously a suspense story. That’s why I told the story by hiding a criminal’s real identity. However, the second half of the story turns into a kind of true-crime film and then takes on a dark fantasy aspect after revealing the criminal’s secret. It wasn’t my plan to compose things this way. However, my interest grew equally among the main character Takakura, his wife Yasuko, and the criminal Nishino. I tried to treat them with equal importance. Do you still shoot with as few takes as possible, like you did when you worked in V-Cinema? I ask because that technique puts a lot of faith in your actors' to go into a scene knowing exactly who their characters are. Is much of your work as a storyteller done by the time you're shooting? I don’t do many takes when I shoot. This deeply relates to the character of the film. For example, Nishino is a criminal in this genre story. However, if we look at him as an individual, he is a bit weird, but also very humanistic, and attractive. 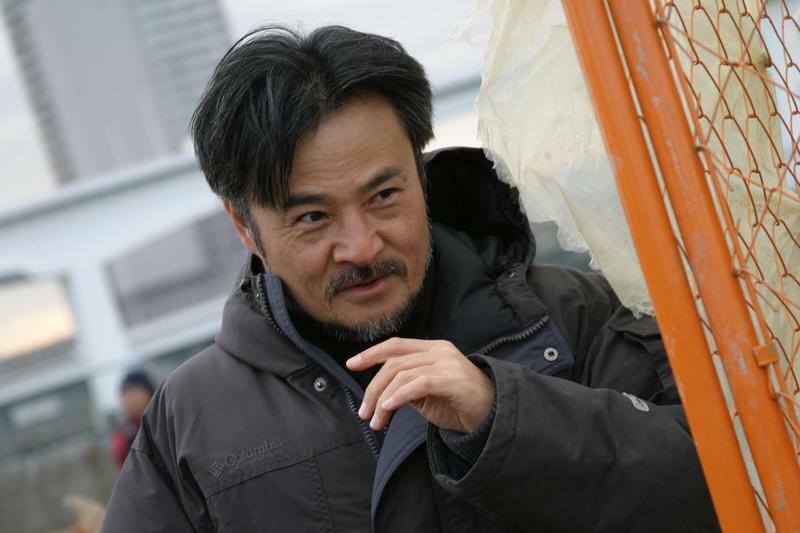 Then the actor Teruyuki Kagawa, who has an unmatched, powerful personality, acts. I would like to maintain those three contradictory characteristics in the camera equally. These contradictions make up the film's character. If I repeat test shoots, this contradiction would become more obvious to the actor, and one quality or another would vanish. I’d like to roll the camera before that happens, when my actor is still holding these contradictions together simultaneously. One of the most interesting aspects of "Creepy" is how obvious it is that there's clearly something wrong with Nishino. In a horror story, or a true-crime thriller, we expect to puzzle over the killer's identity. In this case, we basically know: Nishino did it. He's too weird not to have done it! How did you work with Teruyuki Kagawa to establish his character? I asked Teruyuki Kagawa: even though Nishino is obviously wrong from the beginning, don't show how wrong he is. Then I told him that Nishino is free from social rules, and that he could do whatever he wanted to be the happiest person. Mr. Kagawa understood well, and acted freedly as Nishino. I wondered about Nishino's abject creepiness when I read you saying that the film is Japan in a nutshell in the sense that neighbors rarely interact with each other in Japan. Where does Nishino fit into your view of Japan? Is he just a catalyst for Yasuko, or does his character reflect something about Japan too? Nishino is a monster born out of a typical contemporary Japanese environment with thin human relationships in the local community. At the same time, he is a sprit from traditional Japanese folklore, a sprit who lives in between a village and forest. Next Article: Let’s Me And You Go For A Ride: John McNaughton and Michael Rooker on “Henry: Portrait of a Serial Killer” at 30 Previous Article: Looking for Truth: Tyler Perry on "Tyler Perry's Boo! A Madea Halloween"